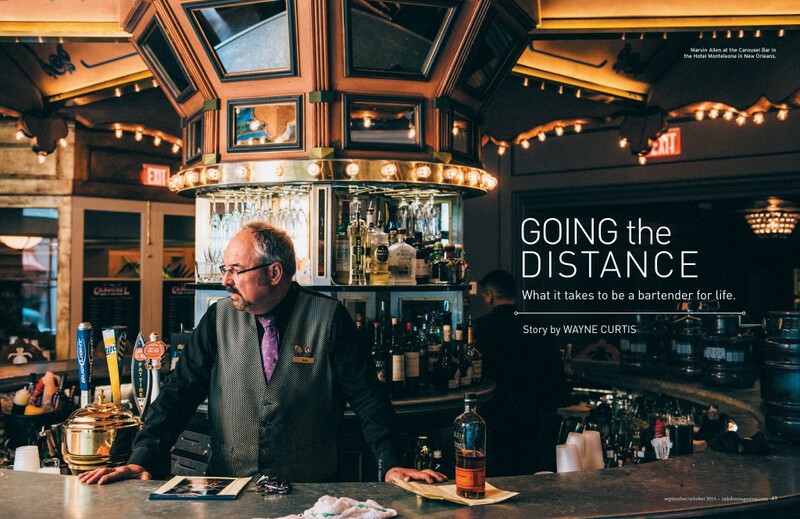 Marvin Allen is working behind the Carousel Bar at the Hotel Monteleone in New Orleans. Like a bad dream for bartenders, the bartop rotates around him every 15 minutes, creating a Sorcerer’s Apprentice scenario of multiplying customers. By the time Allen makes a drink, his guests have moved a few feet away, to be replaced by a new set. To maintain a conversation, Allen has to keep scanning and shuffling, putting on mileage as the guests remain comfortably seated. But watch him and you’ll see that Allen moves economically, just as he does when he makes drinks—there’s little wasted movement or effort. It’s a survival skill he’s honed, and one shared by many long-time bartenders, the best of whom do little with magic or razzle-dazzle. “I make sure I have good shoes with good support,” Allen says. Like many jobs, the key to longevity is keeping what’s essentially a repetitive job interesting. Learning the craft and making the perfect drink can yield rewards in the first few years, but once these skills are reasonably mastered, what’s next? Where’s the challenge? DeGroff cites Sasha Petraske, Jamie Boudreau, Jeffrey Morgenthaler and Sean Kenyon as other examples of successful bartenders who actively mentor. For Kenyon, who’s worked as a bartender for almost 30 years and currently heads the bar at Williams & Graham in Denver, tending bar seemed a part of the family tradition—both parents, and his grandfather, had worked behind the bar. “I knew when I was a kid that I wanted to be a bartender, because I thought what my dad and my grandfather did was really cool,” Kenyon says. His father tried to talk him out of it, insisting Sean attend college, but after graduating, Kenyon says he still wanted to follow the family business. “I was good at math and got scholarships for engineering, but I always wanted to be a bartender—it’s all I really wanted to do,” he says. Abou-Ganim is 54, and he thinks he’s ready. He stays fit, drinks in moderation and gets plenty of sleep. Financially, he started a 401(k) when he was 25, and he’s been planning for the long term, as he advises all early-career bartenders to do. Having a few hundred dollars in your savings account may be fine when you’re starting out and cash pours in nightly, but not when you’re thinking about winding down. “Time is not on your side when you’re 50,” he says.